A kitchen renovation is an exciting opportunity but can be stressful and overwhelming. The renovation can involve several lifestyle changes while the kitchen space and home become a project work site. Homeowners need to consider ways to maintain their lifestyle and get the most from their project. Renovation projects should be done with careful planning. Deciding what aspects require upgrades or alterations is referred to as design the project scope. Homeowners have the opportunity to change as much or as little about the current space as they desire. These are 7 tips to help you get the most from your kitchen renovation. These tips consider specifics of the kitchen renovation and for your life during the renovation processes. An aesthetically pleasing kitchen is a known desire, though a kitchen that offers high levels of functionality needs to be a priority. Consider who will be using the space and how it will be used. The perfect balance of kitchen pathways and kitchen focal point locations need to be found. A “working triangle” considers the location of your sink, cooktop, and fridge and makes sure these all have efficient access to each other. This helps promote a natural flow in the kitchen and help ensure that space will not be difficult to cook in. Your kitchen cabinets are the main sources of kitchen storage and organization. Cabinets can be shelf and drawer based. Shelves offer increased separation and organization, while drawers offer up to a third more storage capacity. A range of cabinet styles is recommended. Shelves to keep spices, appliances, glasses and more organized. Drawers for plates, bowls, pots and pans. Consider the existing style of kitchen space and select cabinetry materials that help complete this style. For cooking, a low hanging spotlight fixture can be perfect. 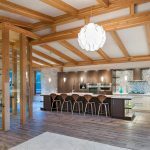 A number of evenly spaced recessed lights, track lights or a large island lighting systems can be ideal for entertaining in the space. A combination of these kitchen light style should make for the most functional space in terms of brightness and shadowing. A surface-mount fixture offers a bulb that hangs bellow the ceiling, proving optimal light spread. Under cabinet lighting or LED strands inside of glass cabinet panels can help brighten up the kitchen. Stovetops are often the most visible and used kitchen appliance. If you are interested in a small kitchen upgrade but aren’t sure what to improve, many designers say the stovetop replacements can offer the largest increase in beauty, function, and value. Range hoods are beautiful additions that can be purchased as a set or separately with your stovetop. Hoods sit above the stove, offering ventilation, extra lighting, and aesthetic appeal. Range hoods can be made from steel, nickel or bronze, while bronze options can be the most costly. Countertops are not solely designed by selecting the style and colour of stone or material. Your countertops need to be roughly 24 inches from backsplash to open edge. 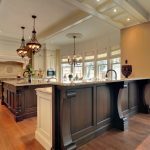 The countertops should offer some level of cabinet overhang so that any spills fall onto the treated floor and not the stained or painted cabinets. Make sure you countertop space in not sacrificed, as too little space, can make food preparations difficult. Attempt to have several inches of space on either side of your sink, stove, and fridge. Deep and large sinks are perfect for high-end custom kitchens. Deep sinks are a common trend because they limit splashing and can fit any large pot. One concern of large sinks though is that to many inches in your sink can make for not enough inches left for countertop space. A preferred balance needs to be found. The most noticeable and used aspect of a kitchen sink is the faucet. Consider faucet style, colours and materials that suit your fridge, stovetop, hood fan and even the oven. If you are a right-handed family consider having you dishwasher installed to the right of the sink. Variable flooring materials offer different benefits. Stone floors can offer the most durable, natural and bold option. A wood or cork floor can be much softer to stand on, making it a better choice for individuals who spend a lot of time in the kitchen cooking. Italian tile floors can offer high levels of durability and can look beautiful. Tiles can be selected in a range of sizes and colours. Grout and spot clean can be required semi-annually to keep your floors looking pristine. So how do you live through your custom kitchen remodel? If a kitchen project leaves you home less than comfortable, your family has some options. Stay in a hotel for a few nights. You can stay at a friends or relatives for the duration of the renovation project. You can also move your bedroom into the basement to avoid dust. You can still have similar amenities like nice beds, fresh coffee, and a shower, though the locations of these items may be different from what you are used to. Keep in mind how much more you will enjoy the kitchen space when the project is complete and stay positive!